Torte―the beloved small-town bakeshop run by Jules Capshaw―is set to hit the stage. But who would have guessed that murder would makes a surprise appearance? It’s the role of a lifetime for Jules. The Shakespeare Festival has returned to Ashland, Oregon, for the season and Torte has been cast as the supplier of Elizabethan-era treats for the main event. But on the eve of opening night, a brawl between Jules’s friend Lance, the artistic director, and a strapping young thespian named Anthony almost brings down the house. . .and the next morning, Anthony is dead. Jules knows that Lance loves his drama―and his just desserts―but she also knows that murder is way off-script for him. Now it’s up to Jules to cut through a bevy of backstage betrayals and catty co-stars who all have their own secrets―before the curtain drops on someone else. . . I love Ellie Alexander's Bakeshop Mystery series. Lance Rousseau is without a doubt one of my all-time favorite cozy mystery characters. Another One Bites the Crust finds Lance, the artistic director of the Oregon Shakespeare Festival, being investigated for the murder of lead actor Antony. It’s true, Lance has a flair for the dramatic. But nothing could have prepared Jules to find him on her doorstep in the middle of the night bloodied. Lance insists Antony is dead, but when police go to investigate, Antony's body is nowhere to be found. Jules starts to think that Lance is having a nervous breakdown because of his recent erratic and paranoid behavior. Lance becomes the prime and only suspect. With Lance and the Professor aka Detective Doug Curtis having such a close relationship, Doug is forced to bring in a detective from a neighboring town to run the investigation. Detective Kerry doesn’t exactly give off warm and fuzzy vibes and she’s keeping Lance locked in a supply closet, dressed in warm-ups. Poor Lance. Jules takes it upon herself to help Lance anyway she can. “Pastry chef by day, sleuth extraordinaire by night.” With the help of baked goods, Jules starts her investigation and learns that several people associated with the OSF have secrets. It seems that not only did Lance have issues with Antony, but so did several cast and crew members. While Jules is doing everything she can to prove Lance’s innocence, it seems that even locked up, Lance is always three steps ahead. Ellie has written a really good mystery. While I always attempt to solve the murder before any of the characters, I found myself most of the time just enjoying the story. Even with the possibility of facing a murder charge, Lance is still Lance. He’s overly dramatic and funny. Yet, he somehow manages to still setup one heck of a scene. You just gotta love Lance. Something very interesting and surprising is revealed at the end of this story. I can’t wait to get my hands on the next book, Till Death Do Us Tart, to see how it all plays out. 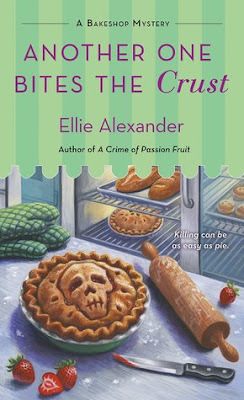 Oh, it should be noted that while Another One Bites the Crust is the seventh book in the Bakeshop Mystery series it is a standalone read. Meet the characters of the Bakeshop Mystery Series here. Ellie Alexander, author of the Bakeshop Mystery Series (St. Martin's Press), is a Pacific Northwest native who spends ample time testing pastry recipes in her home kitchen or at one of the many famed coffeehouses nearby. When she’s not coated in flour, you’ll find her outside exploring hiking trails and trying to burn off calories consumed in the name of research.